Looks great. Teach the boy to pull of caterpillars and beetles instead and you've got it made! He's a cutie. One thing in that photo stands out at me. That downspout just letting the water run down the driveway. Since you have your 'mater containers there anyway not put a rain barrel for water collection under that barrel to use to water you 'mater plants? My first few had bottom rot that problem is now resolved. I put egg shells in the soil but honestly I am not sure that was what resolved it....I think the first few can sometimes have a tendency to have that bottom rot issue, for me it was the first 5 and now I have about 12 on the plant and all seem okay. 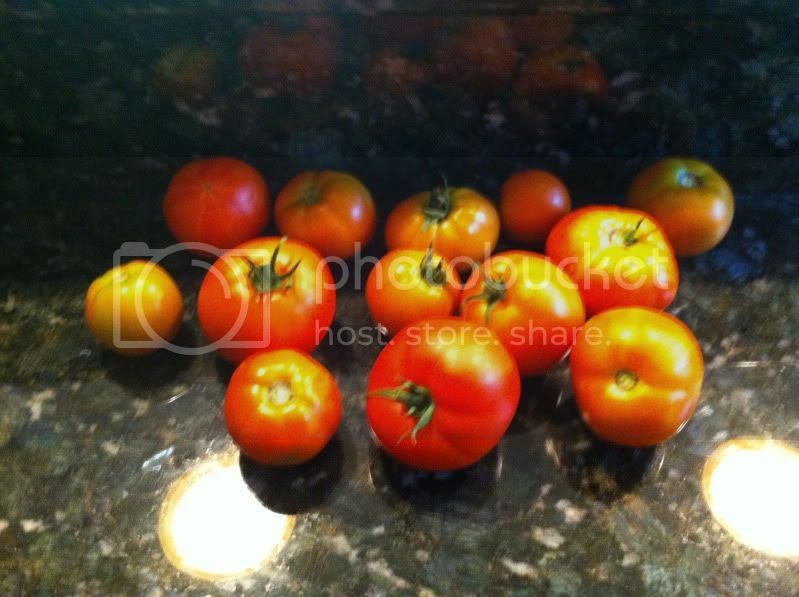 Update on my container tomatoes...smallish, but a few are starting to come in. They taste great! My first attempt at growing tomatoes in containers is going pretty well.....if I can keep the boy from pulling off my yellow blooms! plant a little poison ivy in with them. That should do the trick.